Clearway Gritting is pleased to announce the arrival of our latest JCB gritting vehicle loader. Our new machine will increase our winter maintenance services efficiency and contingency for this coming season, further helping to provide greater confidence for customers. The new loader is capable of moving 3100kg in a single lift reaching up to 7m from the cab, enabling us to rapidly load our gritters and get them back out on the road in a very short period of time. This reduced turnaround time, helps to us to deliver a highly efficient gritting service to all our customers. In addition, the JCB 531-70 is a powerful yet flexible machine, which we make full use of by being able to convert the unit in to an additional snowplough when required. 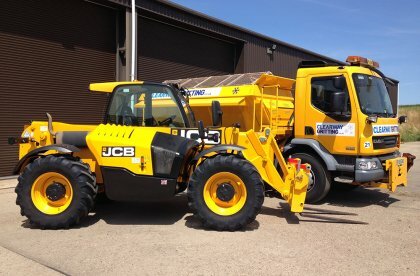 It is all time 4 wheel drive with a 81kw (109hp) JCB EcoMAX tier 4 diesel engine with a wide range of safety specifications which all support our commitment to using only the best equipment to deliver trusted and reliable gritting services throughout the winter. With our latest additional resource, we look forward to delivering continued high quality winter maintenance services to all our customers.